This variety has round bracts instead of pointed ones and it is particularly resilient. The unusual soft-looking shape of its leaves reminds of the ears of a mouse. Inspired by the Christmas poem “The Christmas Mouse” by German storyteller James Krüss, the variety name and a suitable marketing concept in a comic design came about, which should also intrigue the youngest target group. Based on positive experience with numerous commercial deliveries of unrooted cuttings and bare-rooted, substrate-free products in the AutoStix-strip of Visser Horti Systems to customers in North America, Selecta one now goes one step ahead with an innovative development for the European market. Selecta one cuttings are sticked and rooted in a mulitmedia strip in the South. On Selecta’s cutting farm in Kenya, the young plants are sticked in the 34 plugs of a multimedia strip of Visser Horti Systems. The cuttings root within the filled plugs, and every kind of rooting medium can be used. In the current trial series made by Selecta one in cooperation with Visser Horti Systems, a special substrate was used – a peat plug with binding agents and small hole for the cuttings. The young plants are growing under warm and summerly conditions thus being powered with carbonhydrates. After delivery to the European customers, the plants can directly be potted fully automatic. The strips are made of biologically degradable granulate, mainly consisting of polyactic acid and regenerative resources such as e.g. potato flour. Selecta one will distribute this innovation under the product name „ROCS“ with own logo. The name is derived from the term ‚Rooted Cutting System‘. ROCS is a rooted cutting in a substrate in a strip, and processing can be completely automated. Selecta one will present this innovation on the IPM in Essen from 22 to 25 January 2019 on stand 2D21 in hall 2. More exhibition space, new varieties and concepts: At the usual place in hall 2, stand number 2D21, Selecta one presents highlights of the pot plant and cut flowers assortment at its now 220-square-meter stand at the IPM Essen/Germany from 22 to 25 January 2019. 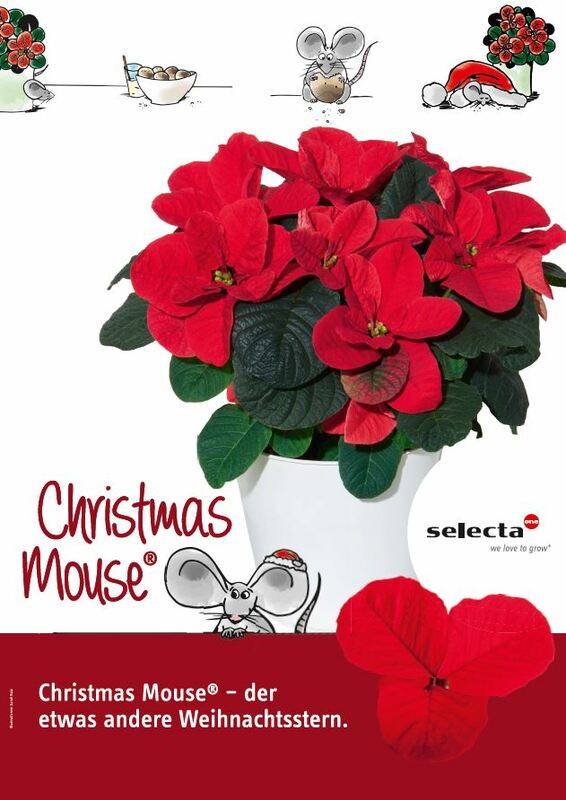 Besides proven Poinsettia varieties such as the Christmas Feelings® family and the modern beauties of the Christmas Beauty series, the breeding company presents an exciting Poinsettia novelty: Christmas Mouse® – the slightly different Christmas star. This variety has round bracts instead of pointed ones and it is particularly resilient. The unusual soft-looking shape of its leaves reminds of the ears of a mouse. Inspired by the Christmas poem “The Christmas Mouse” by German storyteller James Krüss, the variety name and a suitable marketing concept in a comic design came about, which should also intrigue the youngest target group. Selecta one is happy to provide information and support their customers and retail with suitable advertising material. Moreover, Selecta one shows, amongst others, new Poinsettia varieties of the proven Competence in Red series: Christmas Universe – strong Red, strong roots, slim growth, and the new variety Christmas Break, which won the popular LTO Novelty Award for its excellent packing capacity and durability. With its new concept Autumn Friends, Selecta one pursues another trend topic. The customer has no effort with these recommendations for plant combinations, because the young plants grow in a combination pot from the date of potting on. The tested mixes with Lavender and a wide range of pot carnations combined with popular late summer and autumn plants guarantee long-lasting joy and an attractive appearance from the middle of August until the end of November. Further advantages are the short cultivation times and the long shelf life in marketing and also as finished product. This is beneficial for the production, the trading and also for the consumer. Many combinations are possible and bring colour into late summer and autumn. Selecta one recommends selected varieties from its assortment of perennials and grasses for the use as Autumn Friends mixes. The possible combinations are almost unlimited. From the low cost up to the premium segment and regarding different pot sizes and colour combinations, all the wishes of the market can be fulfilled. Special production conditions are not necessary. In addition to the production of combination products, also single pot production for the composition of theme CCs and theme trays are possible. In the second year of the consumer campaign for Pink Kisses®, Selecta one has successfully expanded the positioning of its pot carnation as an ambassador for friendship among young women. Once again in 2018, Selecta one achieved a total reach of almost 40 million contacts online, in print and on social media, as well as live at events and at Pink Kisses® point of sale with an authentic story and attention-grabbing sales displays of the pink pot carnations. The campaign is not only impressing the target group in the relevant media, but the brand impact is also positively reflected in the advertising activities of retailers and the further increasing sales volumes. The green industry in Germany also honoured the campaign with the Taspo Award 2018 for ‘Best Offer for the Next Generation’. Selecta one will continue to encourage and support its customers and retailers to implement the campaign and offers unlimited opportunities to advertise the pink pot carnation at the point of sale. In combination with the strong campaign communication for the young target group, the ornamental plant breeder will continue to pursue this path in 2019 in order to further establish the Pink Kisses® brand. The colour play of the FleuroStar Award 2018/2019 winner Osteospermum ecklonis Purple Sun is like the summer sun setting over the ocean. Several shades of orange fade into a deep purple ring that surrounds the heart of the flower. It has a good branching and an easily controllable plant habit. Purple Sun can perfectly be integrated in any existing Osteo production scheme and the enchanting orange-purple colour combination shines at point of sale. Advantages for the consumers are the non-fading colours and the excellent outdoor performance. Strong red on dark ground – that is what sets the successful variety Moonlight® Tumbao® apart. This vigorous Zonal Pelargonium has very dark leaves and a strong zone. Fiery flowers explode over the leaves – an unprecedented composition. The big flowers in dark red on very dark leaves demonstrate a special colour spectacle. Tumbao is a rhythm from Cuba, and this unique Pelargonium appears exactly like this. It brings the positive attitude of the Caribbean on every balcony and terrace. This XXL pelargonium is very vigorous. Tumbao® convinces with continuous flowering and a great performance in summer. Peach Party® is the variety with a unique play of colours – in spring, this variety features a highly attractive, apricot-coloured bloom, which is the perfect complement to the trend for pastel hues. In summer, the variety develops a vivid red eye, creating a glorious contrast between the dark centre of the flower and its lighter-coloured edge. The variety has single, numerous flowers, and is hardy and suitable for any pot size. The Calibrachoa with three-dimensional colour pattern catches the eye thanks to two bicoloured pink-white circles of inner petals in each flower. MiniFamous® Double PinkTastic® looks spectacular as a stand-alone item in a pot, but also works wonders in combined containers. Flowering from spring until autumn, this beauty with its novel bicoloured pattern produces new flowers over and over again and provides a fabulous summer backdrop. The family company Selecta one is a world-leader in breeding, producing and marketing vegetatively propagated ornamental plants. The breeding activities include bedding and balcony plants, poinsettias, perennials and cut flowers. With eleven production sites and distribution companies in Europe, Africa, Asia and America, the corporate group serves all relevant markets worldwide. Quality and sustainability are our key concepts for innovations in the product and marketing sector, whilst responsibility and reliability are the basic principles for our dealings with customers, members of staff and the environment. Our commercial objective is to create a green product world, to win over and inspire gardeners, the trade and the end consumer.